Once you have managed to get your talking under control, a good next step is to curb your need to state your opinions or offer solutions to problems. By intentionally withholding your ideas and asking for the thoughts of others, you will give them the opportunity to offer their own ideas. How exactly would we get that done? I know these three suggestions sound pretty basic, but, I can tell you from personal experience coaching business leaders that most fall short in one or all of these areas. The great ones do these three things naturally, without thinking about them. With a little practice, so can you! By giving your people a chance to talk more freely, asking for their ideas first and withholding immediate judgment, you will give others the opportunity to bring you fresh ideas and feel more empowered in doing their jobs. And people who feel empowered stay longer in their jobs and tend to enjoy them more. What do you think? 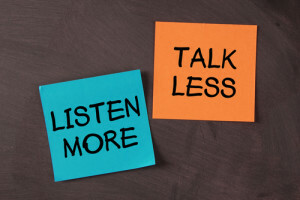 What other ideas do you have to improve your leadership communications?